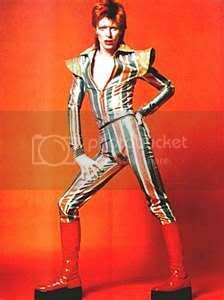 David Bowie the only guy that can pull off a mullet......luv the space odyssey look with all the sequins, ruffled shirts, platform boots and colourful suits..hmm who did this first?.... David Bowie or Elton John? StormeyG wrote: .I probably just made fun of your biggest Icon.. 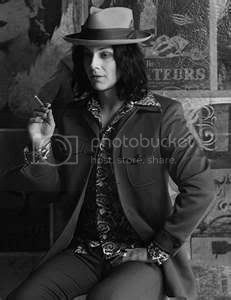 The lovely Jack White........musical talent and style. you are right..I was into goth, but I seriously never had a goth boyfriend. I guess for a goth life is a stage! And I loved wearing beautiful dresses everyday. Isn't that the RS cover of Rolling Stone Curse_t? I think Bowie had developed an alter-ego. Didn't quite read the article, but read he had had many suicides in his family and I think that's where Ziggy came from. 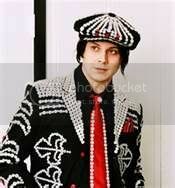 As for Jack White (and he's not bad looking) -definitely got that Goth look, and I'm from the same area. There was a big Goth scene here. I wasn't Goth, but we wore a lot of black. I rebelled by bringing color into the clubs -orange, red and lime green, or silver! Today I see maybe the Emo thing with the Converse flat tennishoes. And the Black Keys interview says White had dissed them in an interview, so they didn't let him into their studio in Tennesee when he visited! @Stormey -yeah, if you liked Kiss, it wasn't for the music! I remember my uncle playing all the Kiss albums! A lot of people liked them! @Curse_t_70, by fashion icons you mean musicians who have a nice style that you can actually inspire on ( Jay Kay, Justin Timberlake...) or musicians whith a peculiar image ( Michael Jackson and preety much every guy dressed cool but would make a peacock look normal) ? Jazzhole wrote: or musicians whith a peculiar image ( Michael Jackson and preety much every guy dressed cool but would make a peacock look normal) ? Jay Kay is definitely an icon -whichever way you look at it. With his hats and dance. Chaka Khan definitely an icon too -her hair and voice just stand for itself. But I just bought for $5, Chaka Khan S.O.U.L. which has got to be her worst live recording! I have to admit, as a kid David Bowie scared me a bit with his looks. But I loved the music of the 70's. Marvin Gaye is one of my favorite artists because he had such a voice with something to say. But he evolved through a huge career, and his style changed. Just like a real artist. Didn't stand still. But this is the style I think of him in; deep in urban contemplation. And maybe he influenced Jamiroquai's early stuff, because they had a lot to say too. Soo..we are comparing a genious like David Bowie, who influenced entire generations based on his character Ziggy Stardust, with Jay Kay, who is the lead singer of a band a gazilion people never heard of and wears blue trousers with t.shirts in every single ocasion? caroli wrote: Soo..we are comparing a genious like David Bowie, who influenced entire generations based on his character Ziggy Stardust, with Jay Kay, who is the lead singer of a band a gazilion people never heard of and wears blue trousers with t.shirts in every single ocasion? Ofcourse not... we can't compare Jay with Bowie... Bowie would lose! Oooh, was that a dig? Hmmm. well I'm older than you and this is how I see it! Bowie has about 20 years on Jamiroquai. Different generations! Bowie, kinda the punk that influenced Rock. Yet he associated with Iggy Pop & Bing Crosby His music has full circle (25 studio albums). Bowie's music continues to play on. As for Jamiroquai, JayKay probably grew up on Bowie, like me (same generation). Jamiroquai has been all over the world in popularity too! They've had their niche in music too: acid jazz/funk. But the best thing about Jamiroquai, is their music is quality stuff. Jamiroquai is the band, I think, that'll actually come back around in popularity for their back catalogue. As for what someone wears, who cares! Blue trousers (or jeans) and t-shirts suits me just fine! As for fashion (in hats) I'm thinking Marvin probably influenced JK and Eminem! It is a huge statement. To me, for each artist it represents the function of clothing. Not fashion. And maybe represent the poor, urban. And anonymity of mankind. Hmm.. Bowie is an icon in Music AND Fashion (as the title of the topic suggests).. Jay is a singer who wears hats. I do realise this is the Jamiroquai forum and we are the JPP but seriously, when Bowie dies it will be noticed everywhere just like MJ or Amy Winehouse (even in a smaller scale) and I'm very sorry to say that I don't predict the same future for our friend here.. I disagree. And really, how we perceive artists is all perspective! Either Bowie didn't hit me as hard as he should have, or I just think better of Jamiroquai's future! But I guess Jay'll have to go on for another 20 years to really see! But I think the subject is misc: Icons in music and fashion. The artists don't need to be complete equals, do they? And they really aren't competing, right? I'll add in Prince! Who btw is coming to my town this June! He was an early artist who crossed over from music into film. aaah Prince <3<3<3 I absolutely LOVE him (but I think you noticed it already) and I will add Simon Le Bon from Duran Duran..
Duran Duran! Are they making a comeback? How do 20 year olds know all the 80's music? Duran Duran, Madonna, David Bowie & Prince? Does your radio play them? Does your family play them? One classic station that plays 70's rock, so some Bowie. But no DD or Madonna. What's the word on Freddie Mercury? Would he be concidered an Icon? Giba7 wrote: How do 20 year olds know all the 80's music? Well these kids have moms and dads that grew up with the stuff.......techanically I could have a 20year old childwhich I don't and if I was a "mainstream" teen in the 80s which I was not I would probably be feeding all that retro stuff to my kids...... but nooo.. my kids get to hear Jamiroquai, White stripes, Black keys, Supergrass, Slayer, Voivod...lets just say they get a wide variety! And my kids do know Queen. But some artists won't be played, and that's the way it goes. And funny to see my nephew (almost 16) post actual album covers on his wall. Obviously from his parent's collection: U2 and other meh artists.